President Donald Trump has vowed to send the US military to the secure the nation's southern border with Mexico. Both of Mr Trump's predecessors in the White House deployed National Guard troops to help secure the US border. President Barack Obama sent hundreds of soldiers to guard the boundary, while President George W Bush deployed thousands of troops to help Border Patrol in what was called Operation Jump Start. 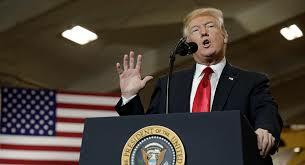 On Tuesday, Mr Trump said the North American Free Trade Agreement (Nafta) was at risk unless Mexico stopped the flow of migrants.